Father's Day in Zehland means a family gathering with a barbeque. But that's not all! 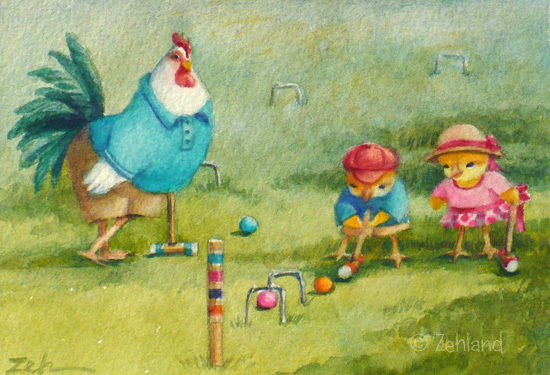 After everyone has had their fill, while Mother Hens are cleaning up, the Rooster Dads go out on the lawn with their offspring for a lively game of croquet. As long as the weather is nice. Well, the weather was very nice on this Father's Day. So everyone got their colored balls and mallets and went out to play. Nina nervously watched Ferdinand take his turn. Her pink ball was in jeopardy! If Ferdinand hit it, he could knock her ball right off the lawn. She hoped he would miss. Ferdinand, for his part, took careful aim. Maybe he could get his ball through both the hoops and hit the pole. Then he'd become poison! He would like that! The big white rooster stood proudly watching Ferdinand and Nina. He looked sharp in his new blue shirt. 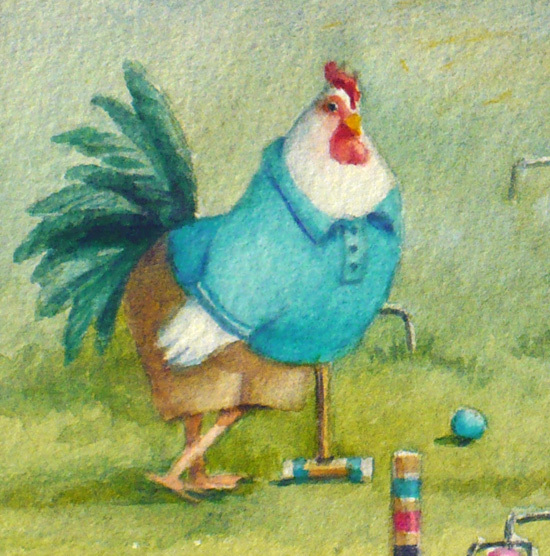 Of course he had a matching blue ball and croquet mallet. 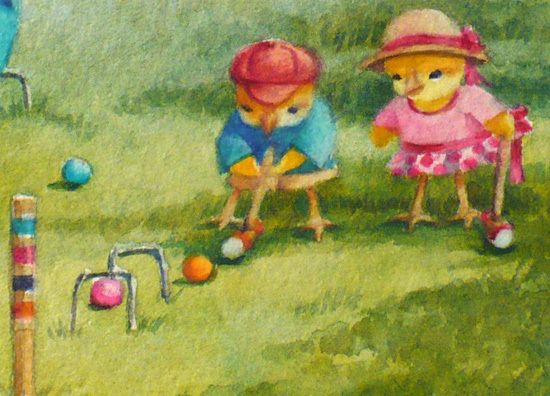 I cannot tell whether he was ahead of the two chicks in the game or behind. He looked pretty satisfied, but then fathers are happy if their children are happy, so who knows? One thing is sure. He was very happy to share his special day with them!